Scientists with the Canadian Sea Turtle Network and fishermen spent days on the look out for leatherbacks. Since leatherbacks spend less than half of their time at the surface of the water where you can see them, finding these reptiles in the immense Atlantic Ocean is hard. And, even when leatherbacks are at the surface of the water, they aren’t easy to spot. It takes good eyes to find them—eyes trained by years of scanning the ocean waves. That’s why the CSTN is so lucky to work with commercial fishermen. It can be hard to tell the difference between a leatherback head poking through the surface of the water and a breaking wave. But after years of working on the water, fishermen tend to have what the CSTN calls “good eyes.” On the field boat, fishermen often point to leatherbacks well off in the distance, yelling “Turtle!” and gunning the motor long before most of the field team can make out the leatherback they’re pointing to. This year, the CSTN spotted our race turtles off the tip of Cape Breton Island. But it isn’t always easy to get them tagged. When the wind is high, it is not only difficult to find turtles amidst the waves, but also impossible to work with them safely. Leatherbacks are big and heavy (the CSTN caught a leatherback one year that weighed 640 kilograms! ), so it is important to ensure the boat isn’t pitching in a big sea when a turtle is on the CSTN platform. On the best days, when the wind is less than 10 knots, the sea stretches around the boat like a sheet of glass and leatherbacks are lazing at the surface, purplish-red jellyfish tentacles streaming out of their mouths. Weather permitting, the CSTN field team pulls a leatherback onto the tagging platform at the back of the boat (which is partly submerged in the water), and then begins to “work up” the turtle. Researchers at CSTN took plenty of measurements of the giant turtles in this race, including the length and width of their carapace (or top shell) . Leatherbacks migrate to waters off Atlantic Canada to chow down on jellyfish, their primary prey. Canadian waters are some of the most important feeding grounds for these endangered species in the Atlantic. All of that eating means that leatherbacks found in Canadian waters are usually nice and fat—and approximately 33 per cent heavier than when they are found back on the nesting beaches. The field team has a good look at each turtle to check for any scars or amputations. 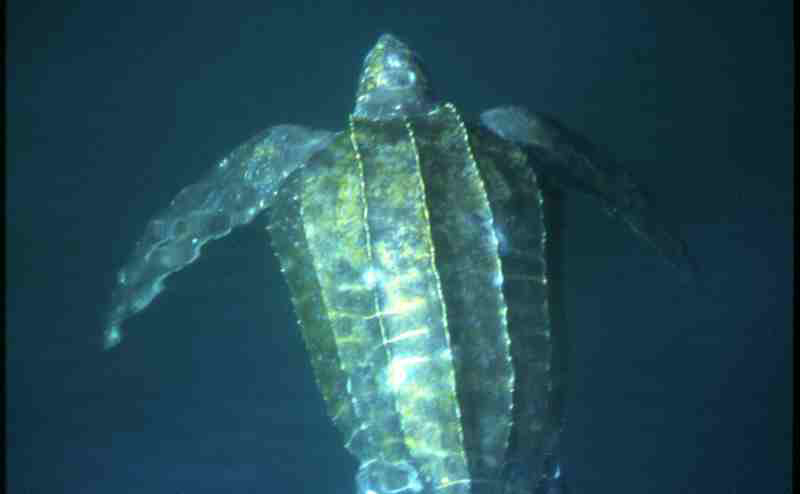 Scars are most often caused from the turtle striking hard structures like boats or fishing gear. Although sharks will also take a bite and sometimes can remove a chunk from a flipper, so the researchers note that too. This can sometimes help scientists understand what hazards these mighty reptiles have come across on their journeys. Just like Fido, leatherbacks are marked with microchips in their right shoulders. These “passive integrated transponders” or “PITs” are the same ones that veterinarians often use to mark dogs or cats. PITs are one way sea turtle scientists are able to identify individual sea turtles. This helps them learn not only which part of the world the turtle came from, but also sometimes the nesting history of female turtles, or facts on changes in their growth. Turtle researchers also use flipper tags—stainless steel clips that are attached to the leatherback’s rear flippers—to identify turtles. The CSTN field team checks for both PITs and flipper tags on the turtles it works with. If the turtle doesn’t have any, it leaves the boat with a PIT and two flipper tags identifying it as a Canadian turtle! The field team also collects DNA samples from the turtle’s flipper which are sent to a lab in the United States, where they can tell from running tests on the DNA which nesting stocks each leatherback has come from – from Florida to Trinidad! The Canadian Sea Turtle Network attach the satellite tag directly to the ridge of the leatherback’s shell. Although the tags themselves are small, measuring approximately five inches in length, their price is not. They cost about $3,500 to $5,000 each. But the information we get from the tag makes them worth every penny. 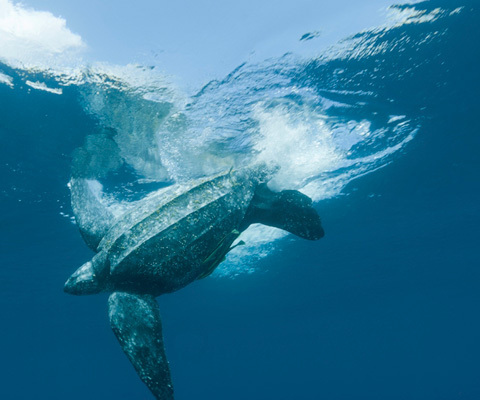 A satellite tag picks up on all kinds of information, including where the leatherback is in the ocean, how deep it’s diving, how fast it’s swimming, and even whether the water is balmy or chilly! The amount of data the transmitter sends is like a quick snapshot of what is going on. To get the whole story, scientists need to actually get the tag back. That’s no easy feat! 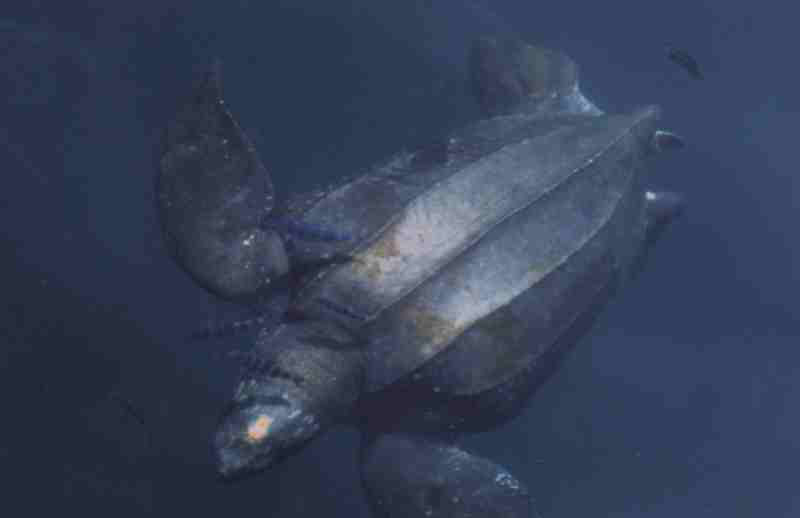 First of all, the leatherback has to be ready to nest while the transmitter is still on her. The Canadian Sea Turtle Network team then has to track which nesting beaches she might be headed to and give researchers from those areas a heads up that a tagged turtle is headed their way. Then everybody crosses their fingers that those scientists will be able to track down the tagged turtles on the nesting beach and retrieve the tags. With the tag in hand, scientists at the Canadian Sea Turtle Network will be able to learn all about the turtles’ journeys.